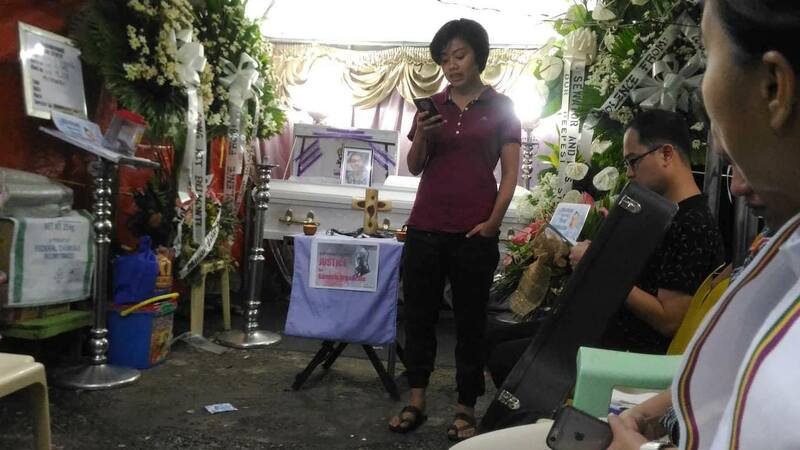 Young church people expressed on July 24 disdain over the death of Genesis Argoncillo in a service at the public square of urban-poor area Sauyo, Quezon City, where his wake is. Argoncillo was apprehended on June 15 in Sauyo, Novaliches area, his home since migrating from Iloilo in 2009. He was detained at Quezon City Police District Station 4. Elder sister Marilou, who attended the KKKP event, said Argoncillo complained about his cellmates beating him up. Tuesday, Marilou learned during a routine daily visit that her brother was rushed to the hospital and declared dead on arrival. 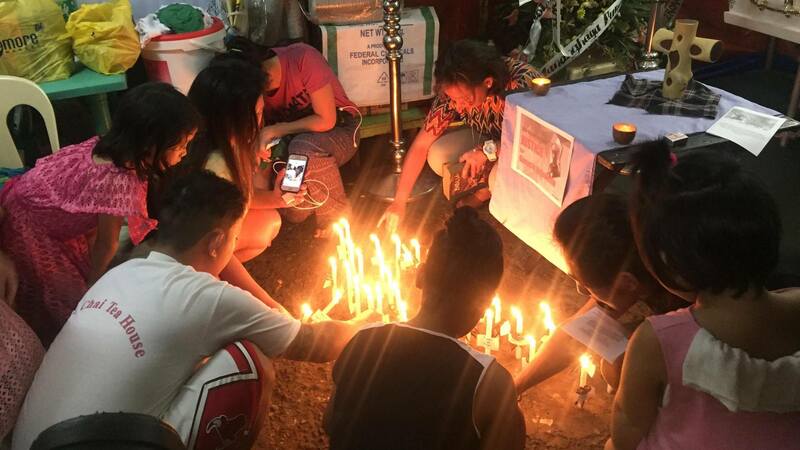 The death amplified public criticism of Oplan Galugad, what had been the definitive reason for Argoncillo’s detention until authorities changed their narrative. The crackdown has detained thousands as soon as President Rodrigo Duterte said in a speech on June 13 that “tambay” posed a threat to society. As operations went into full swing, reports have noted that even people simply waiting for their ride home or meeting friends were taken into custody. Human rights advocates have cautioned that the policy resulted in baseless arrests; lawyers have released instructions for civilians to prevent or dodge detention. Even top-ranking police officials have reminded the public that they may refuse “invitations,” or that police can’t use force on them. “Mula noon at hanggang ngayon, ang mga ordinansa, mga batas, mga panukala ay patuloy na prinoprotektahan ang mga nasa poder o ang mga may maayos ng buhay, hindi nagiging layunin ang hamigin o maipadanas sa mga nasa labas ng pinto ang isang buhay na ganap at kasiya-siya,” said United Methodist Church Pastor Hazel Joyce Salatan in her Mensahe ng Buhay during the liturgy. She was with faculty members and seminarians of the Union Theological Seminary in Dasmarinas, Cavite. Solidarity messages from the different organizations ventilated both hope for a better society and trouble over the culture of violence reigning across the country. 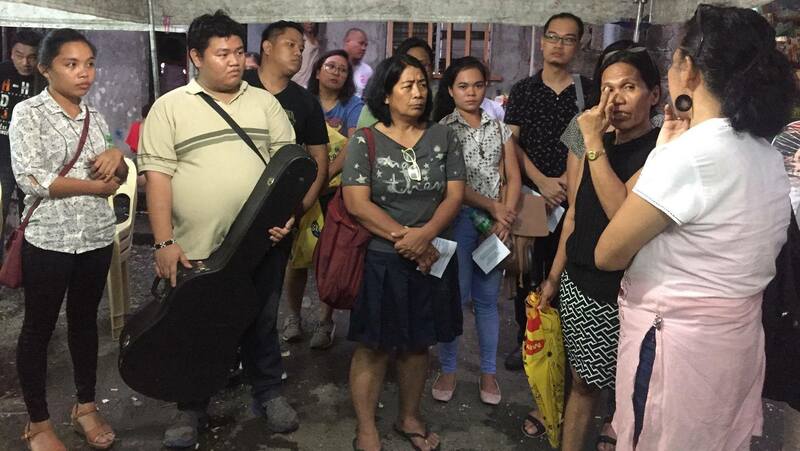 The United Methodist Young Adult Fellowship, the youth group of the Evangelical Methodist Church in the Philippines and the Youth of the Iglesia Filipina Independiente criticized the seeming disregard for the sanctity of life. Metropolitan Community Church and The Project Red Ribbon also joined the call to end impunity. “Nang pasimula pa lamang / lumikha na ng mga panukala ang administrasyong ito! / Mga panukalang laban sa mahihirap,” said UMC Pastor Carleen Nomorosa of the National Council of Churches in the Philippines in a fierce and impassioned poem hitting “Duterte’s Genesis” of deaths. Echoing the same observation, the Promotion of Church People’s Response and Rise Up for Life and for Rights, a network helping victims of extrajudicial killings and their families, hit Oplan Galugad and other measures that have espoused state-sponsored violence and disproportionately impacted poor communities. 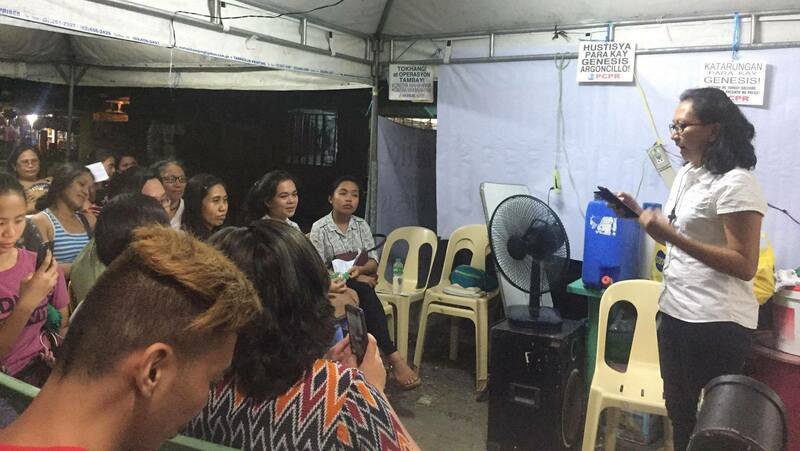 In response to the youth-led service, Marilou said: “Nagpapasalamat po ako dahil nasama kayo sa aking hangarin na maabot ng kapatid ko ang hustisya sa ginawa sa kanya. 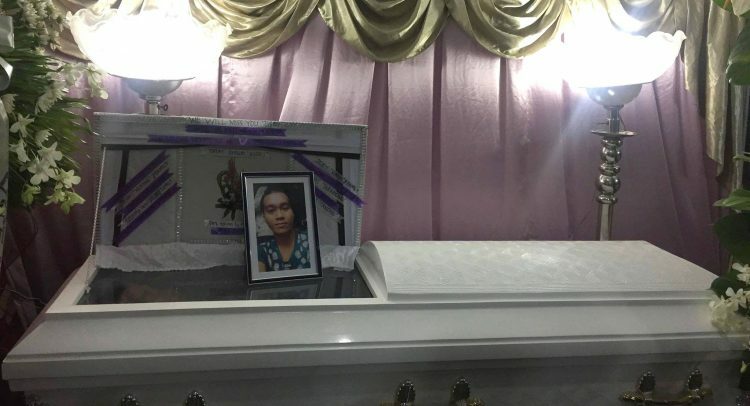 Sana hindi tumagal ang isyu sa kanya … at mabigyan na kaagad ng hustisya,” she said. The liturgy ended with a candle-lighting activity that Sauyo residents – young and old – joined. Kalipunan ng Kristiyanong Kabataan sa Pilipinas is the biggest aggrupation of youth organizations from Protestant and non-Roman Catholic traditions rooted in the prayer of Jesus for Christian unity and engaged in united action for peace and justice. 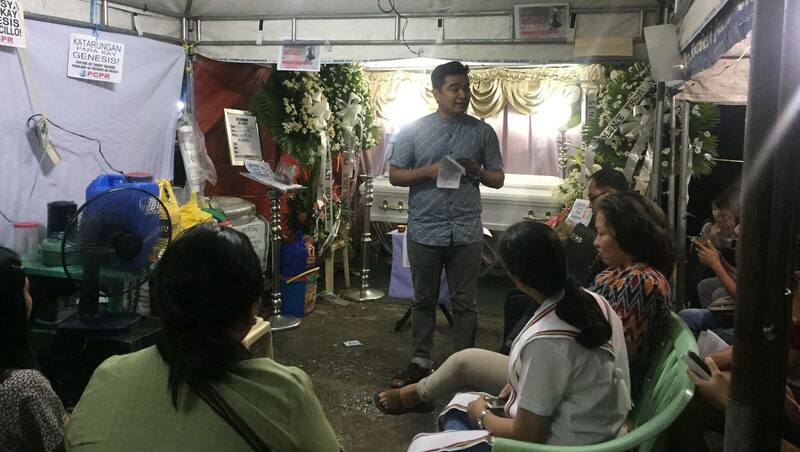 The service held at Argoncillo’s wake is part of KKKP’s Dasig program, which brings young people face-to-face with personal stories reflecting bigger issues in society.